The largest democratic elections in the world took place in India. India has a population of over 1 billion people (the second largest population of any country, after China). Over 400 million people voted in these elections. The elections were held in five phases, over a month. There were 800,000 voting centers across the country! The elections were won by a political party called the Indian National Congress. 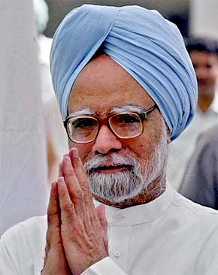 Manmohan Singh, the current Prime Minister of India, was re-elected for a five year term on May 22. Many Indians viewed this positively – in fact, when the Indian stock market opened up after the elections, the stocks shot up so fast that trading on the market had to be stopped that day! People have been living in India for over 9,000 years. India was ruled by the British for about 200 years and got its independence in 1947. Before its independence, the countries of Pakistan and Bangladesh were also a part of India. Many languages are spoken in the country, but the most commonly spoken language is Hindi. There are many religions in the country, but a majority of Indians are Hindus. Played the game “snakes and ladders”? The game originated in India and was originally designed to teach Hindu children about good and evil, where “good squares” take a person higher in life and “evil squares” bring a person down in life.